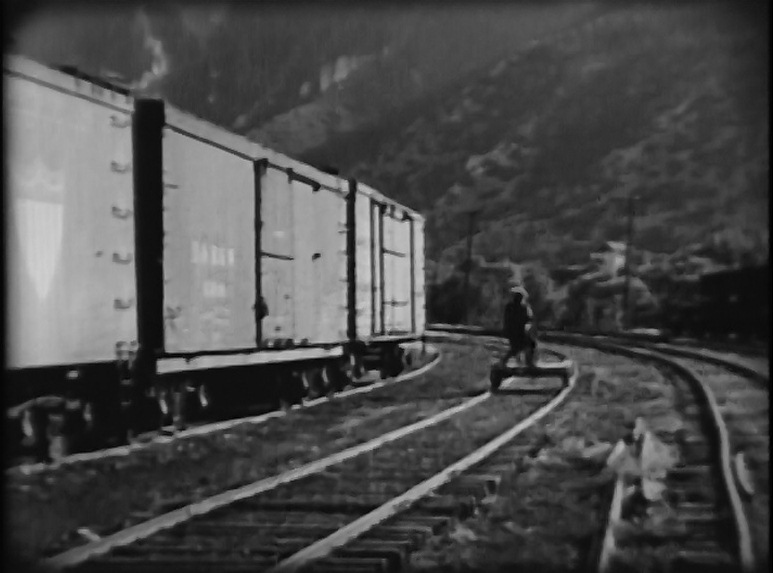 I first saw scenes from this movie long ago whilst watching a railroads-in-movies anthology on TV. This silent gem had all its exterior shots “Photographed in the Royal Gorge of Colorado, U.S.A.” We never do find out what “K&A” stands for, but it’s full of action with trains galore. 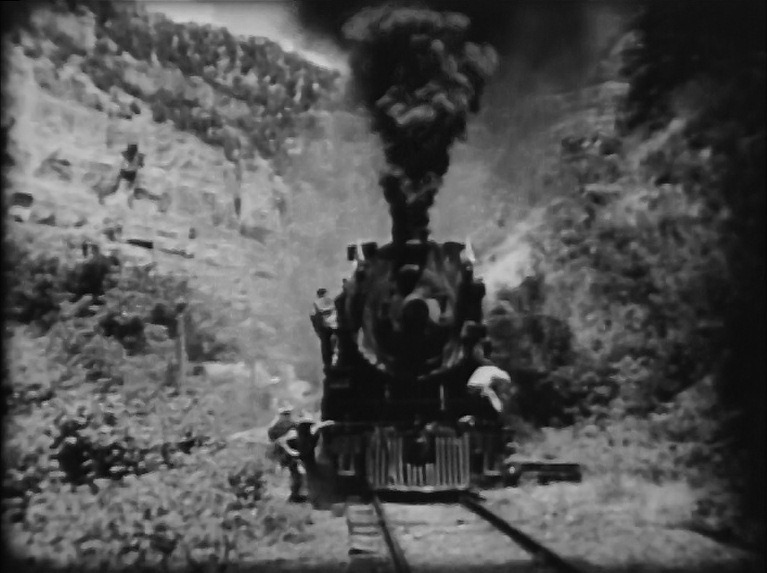 Filmed on the Denver and Rio Grande Western Railroad before their “Dotsero Cutoff” was constructed, D&RGW took the long way from Denver west — first heading south to Pueblo, then up the Arkansas River through the Royal Gorge, over 10,000 foot Tennessee Pass and on to Salt Lake City. 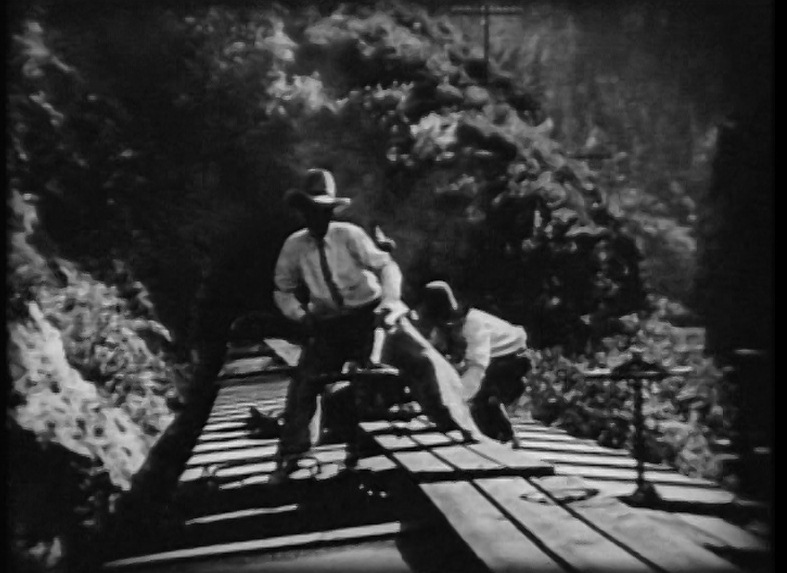 This was serious mountain railroading in the 1920’s. $10,000 reward? That’s BIG bucks back in 1926 ($133,671.75 in 2015 dollars). Let’s catch those terrorists and score some serious wampum! 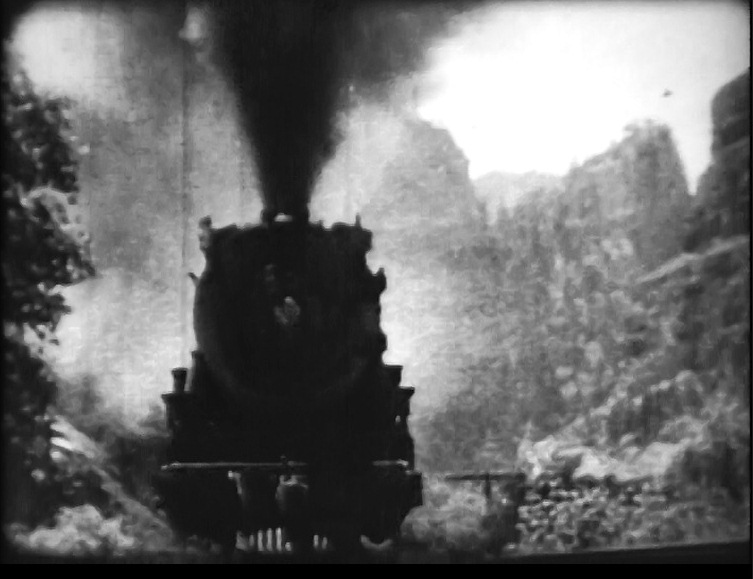 ; D&RGW steam engine charging through the Royal Gorge. 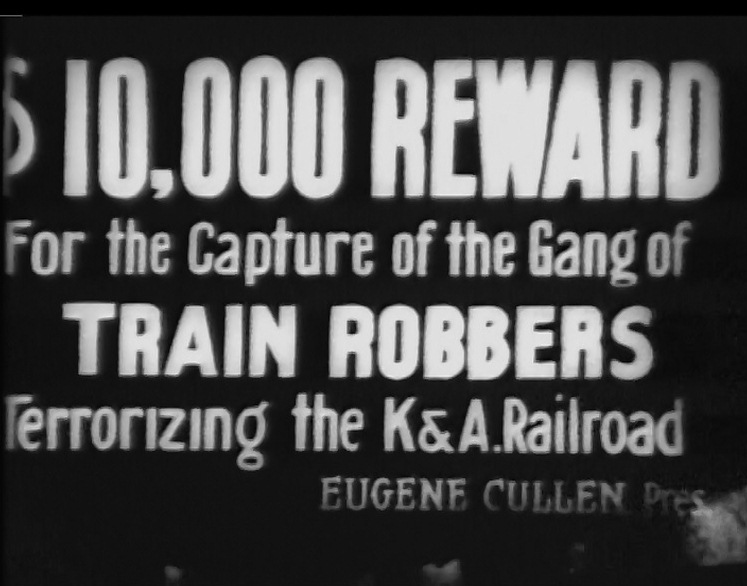 A silent picture means there are lots of these title cards explaining what’s going on. 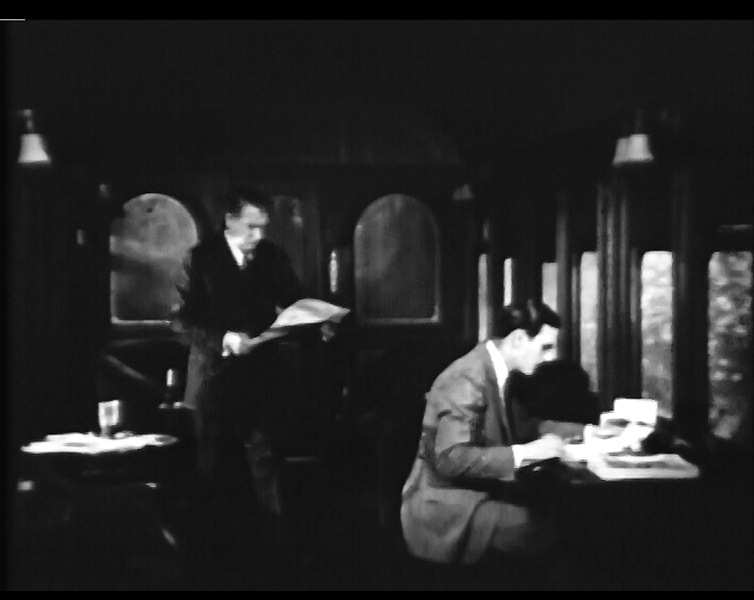 Here we see the boss Eugene Cullen (played by William Walling) with his confidential secretary Burton Holt (played by Carl Miller) onboard the president’s private rail car. The title card hints that Holt is a bit of a girlie man! 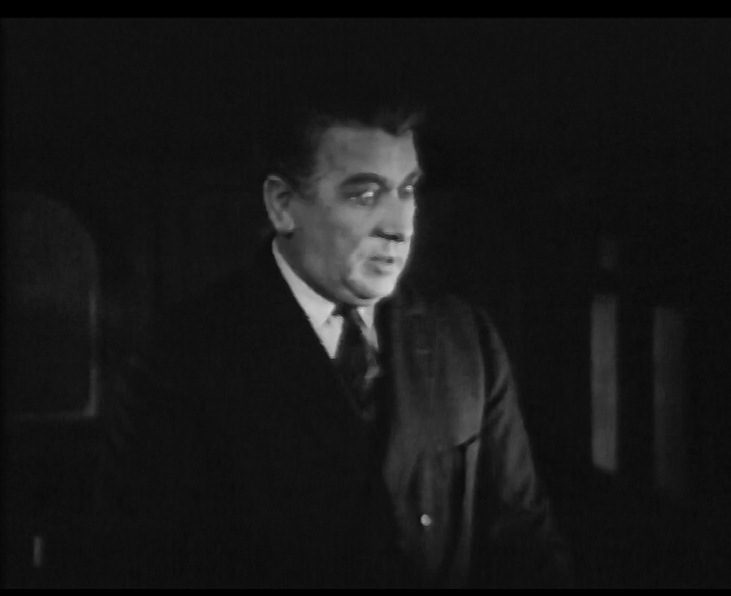 I just love it when actors open their eyes WIDE in old silent pictures. It is so creepy. 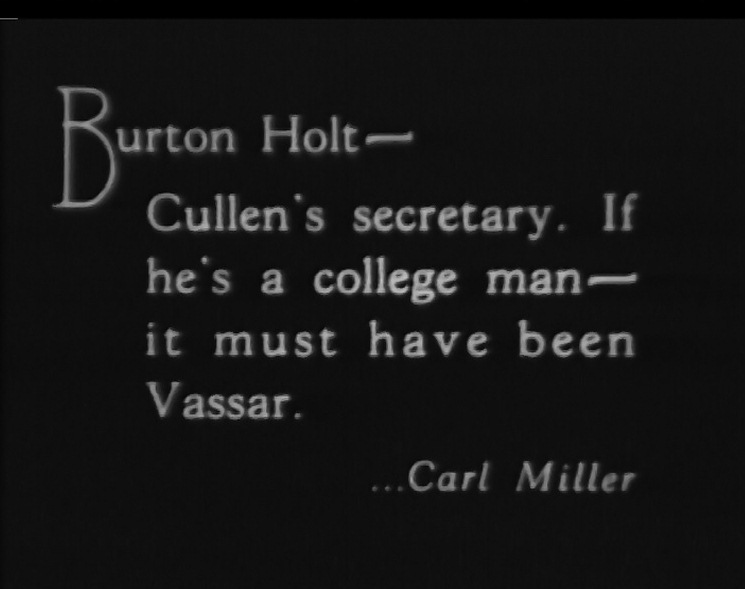 Maybe Cullen is just upset over the telegram’s message. 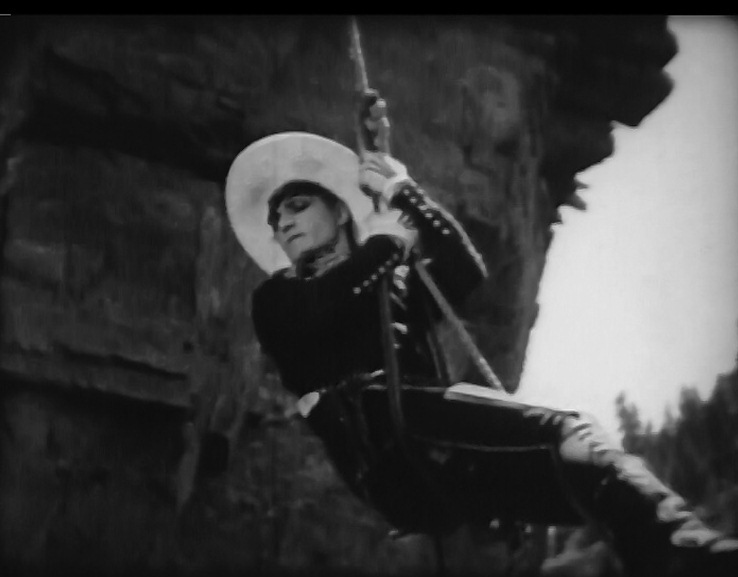 The hero, Tom Gordon (played by Tom Mix), seen here suspended above the Gorge listening in to the bad guy’s plans. Really. He’s got his hand cupped around his ear and everything. Unhand me! 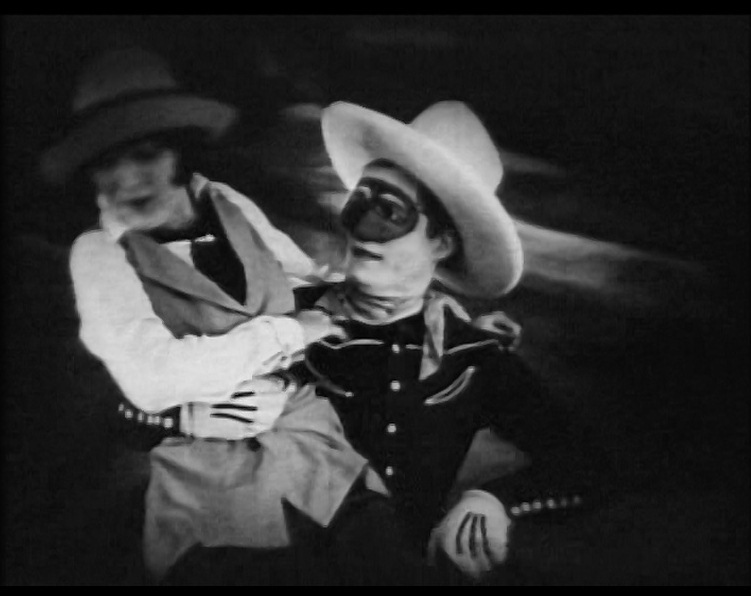 Masked Gordon (love the outfit) rescues the president’s daughter Madge Cullen (played by Dorothy Dwan) from the pursing train robbers and hoists her up onto the train from his trusty steed (played by Tony, the Wonder Horse). Gordon is posing as a highwayman. 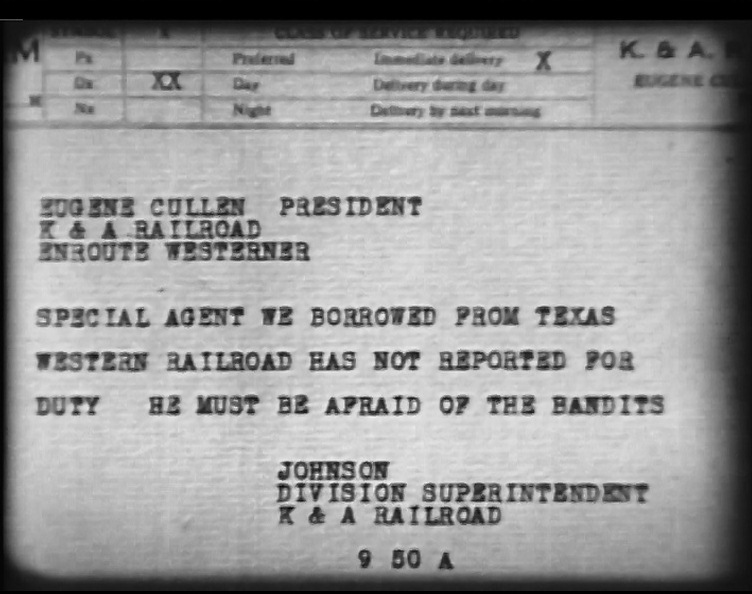 He is actually the “Special Agent borrowed from Texas Western Railroad” mentioned in the above telegram. 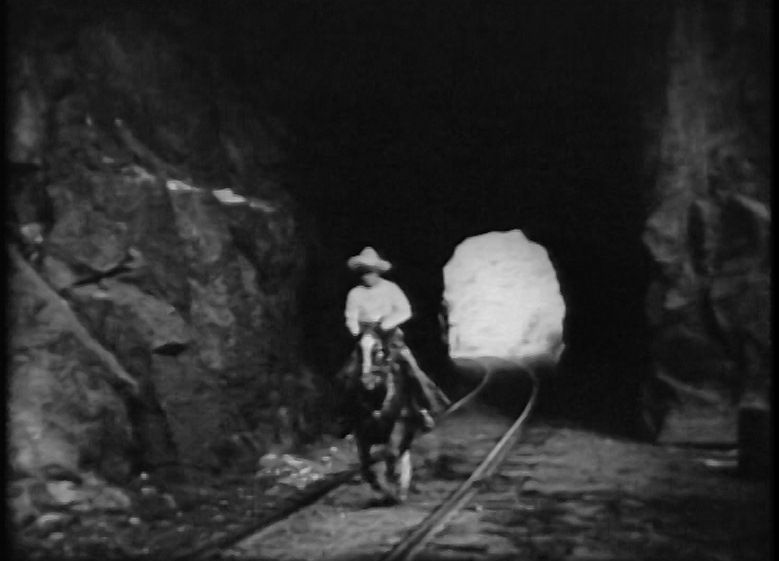 Since he knows Holt is tipping off the train robbers of the railroad’s plans, he continues this ruse. 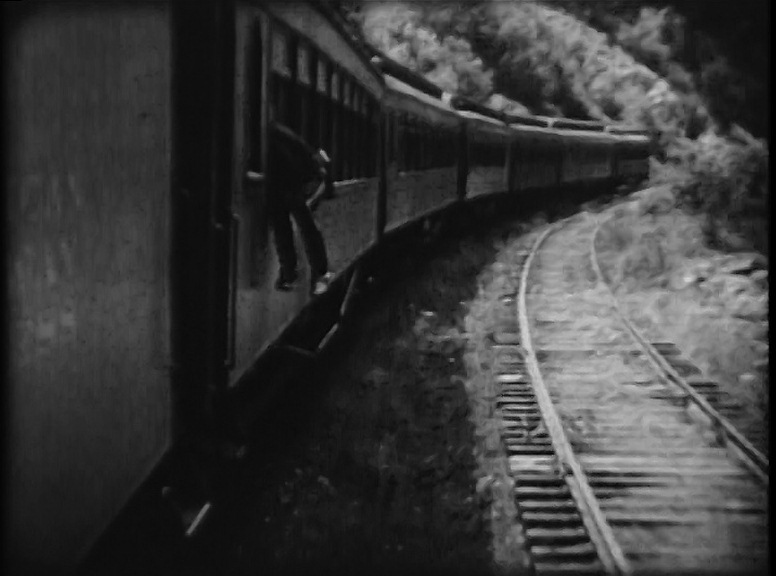 OK, let’s get back to the train scenes which is what we’re really after here. Did you know you could open the windows on an old sleeping car? I didn’t either. Here we see Gordon calming a matron (Shhh!) 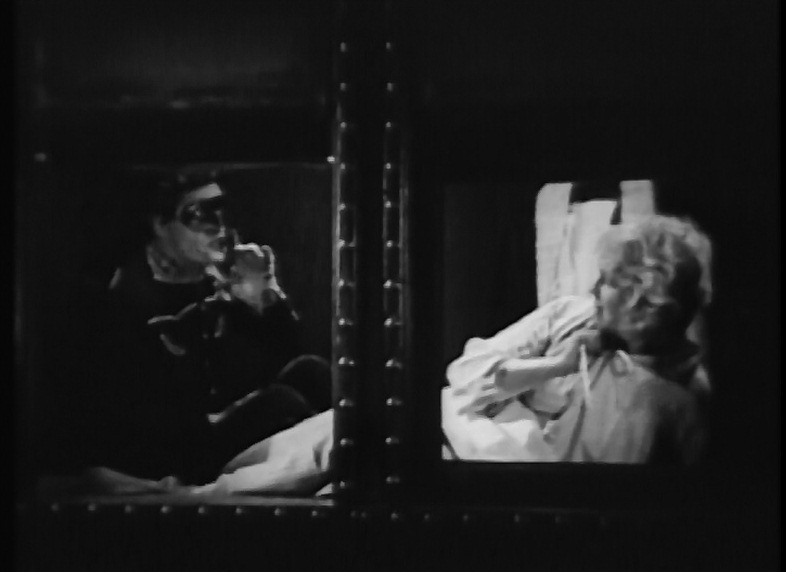 as he climbs out the window of her bedroom. Depot scene at what LOOKS like Glenwood Springs, Colorado; Closeup of D&RGW 1523 belching coal smoke. 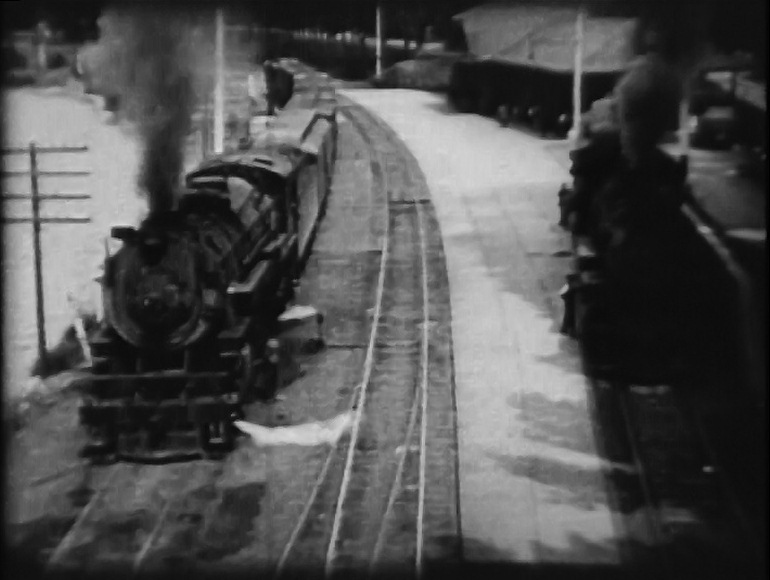 I was only able to identify two locomotives in this movie. D&RGW 1523 and 1524 (seen coming out of a tunnel). Both were Class M-67 4-8-2 “Mountain” type steam locomotives built by Alco in 1922. They were scrapped in January 1952 and August 1949 respectively. 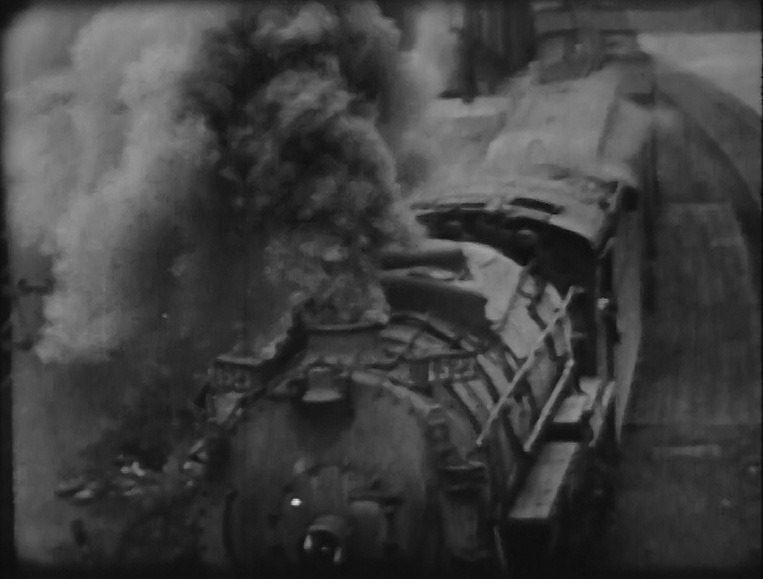 Also, most trains seen in this film ran with headlights extinguished. I’m not sure if this was regular practice or if the light would over-expose the filming. 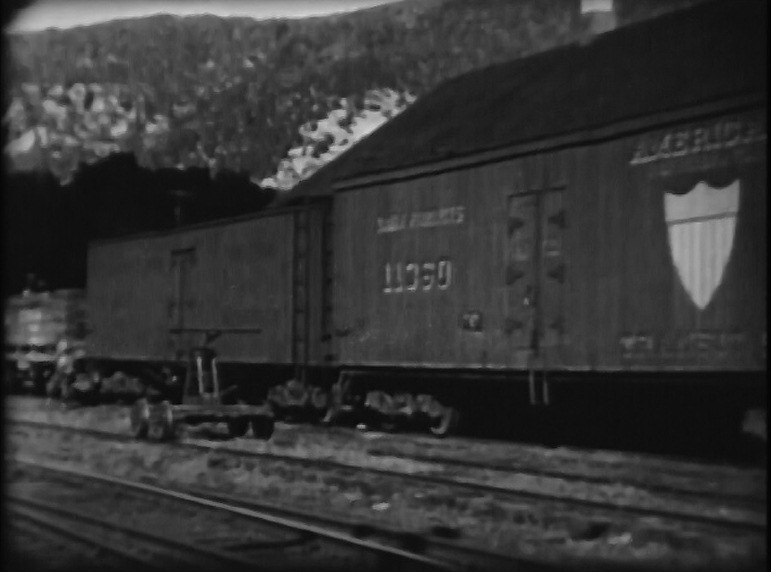 Nice views of some early wooden “reefers” (refrigerator cars kept cool with ice stored in end bunkers). 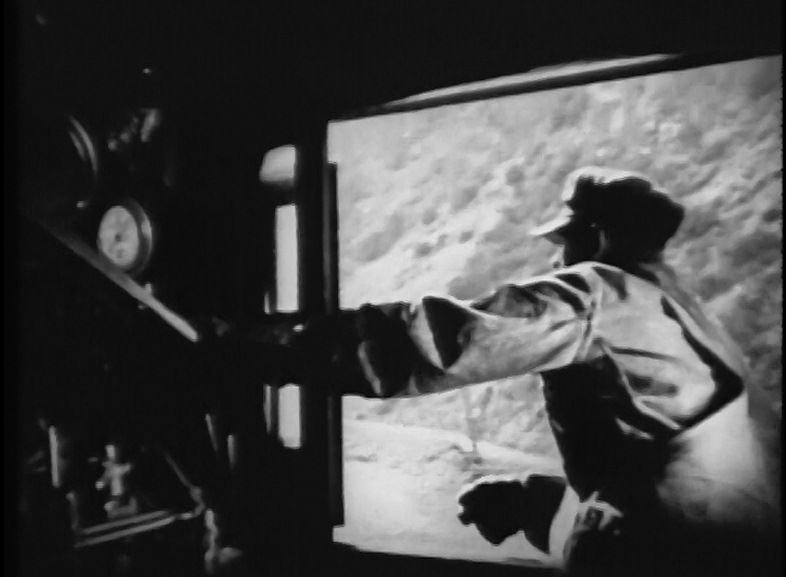 Cullen talks to the baggage man on his train; Highball from the train’s conductor. 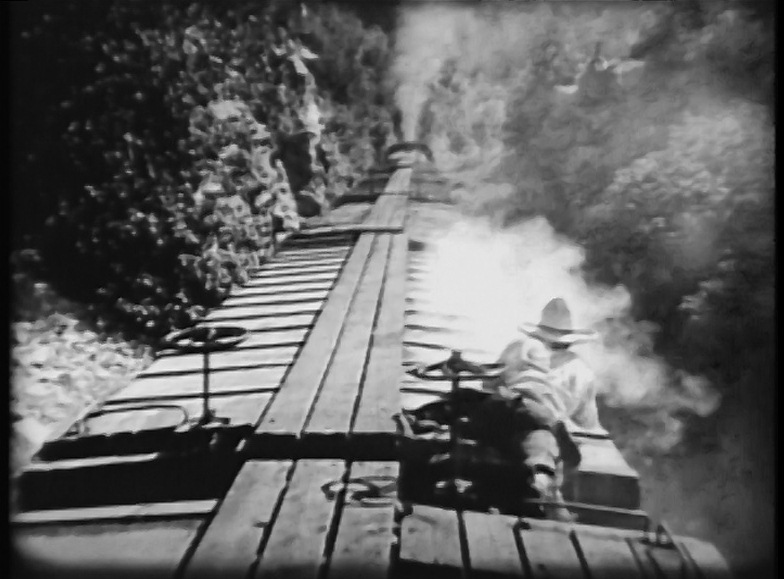 Classic shot of hogger working the train; making some smoke for the camera thru the canyon. 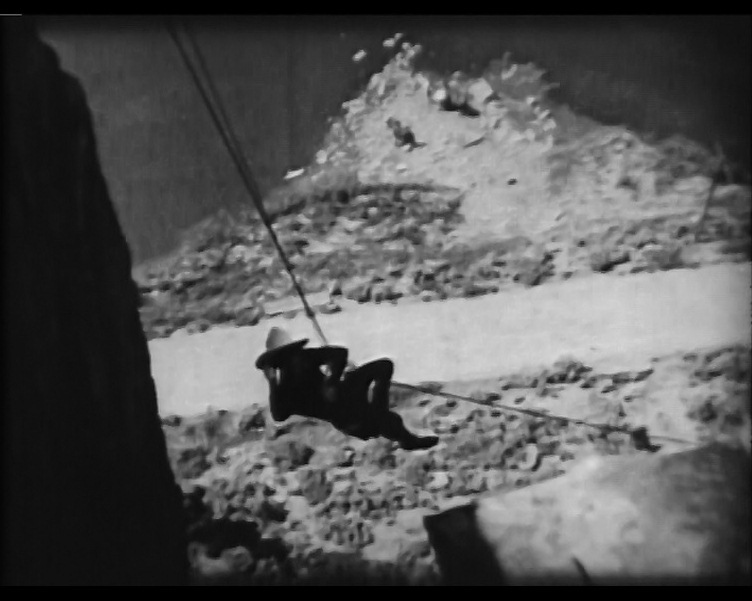 These are the scenes I remember from that TV show: Gordon (Tom Mix in action!) 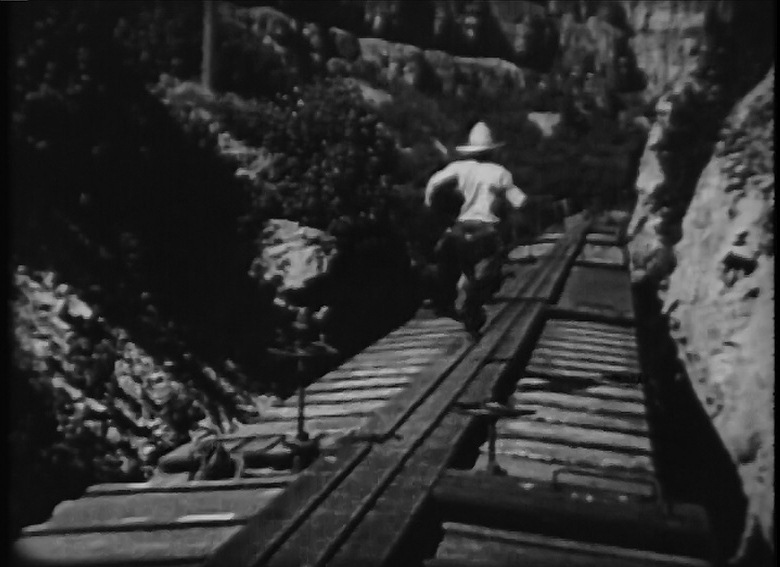 dashing along the running boards atop the freight; Gordon shooting it out with the bad guys. 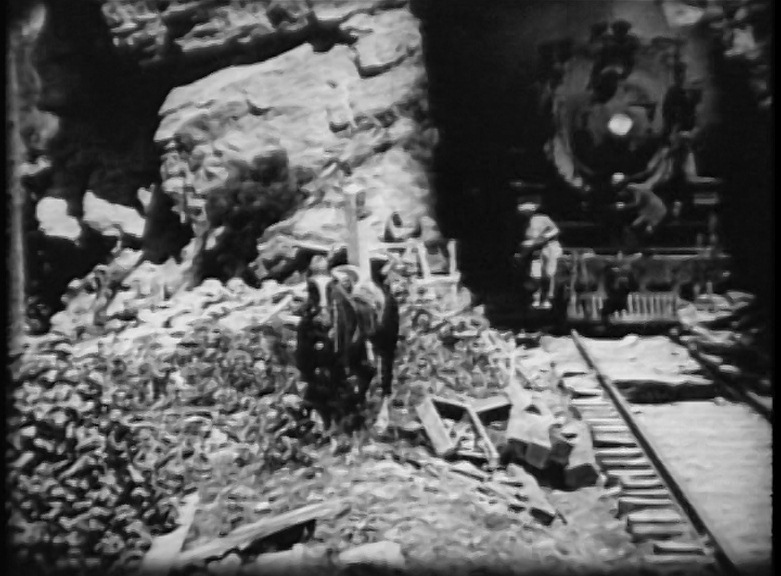 The bad guys shooting back just before the train hits a tunnel (Unlike Wile E. Coyote, they did duck); Gordon and Tony ride through the railroad tunnel in pursuit. 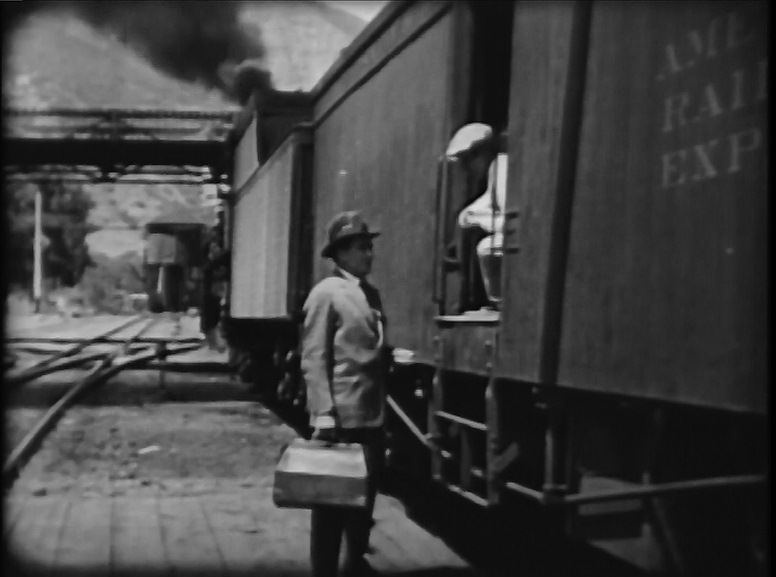 Loading up into the baggage car; Coming up on the bad guy’s hideout (engine headlight illuminated). All in all, not a bad little movie. 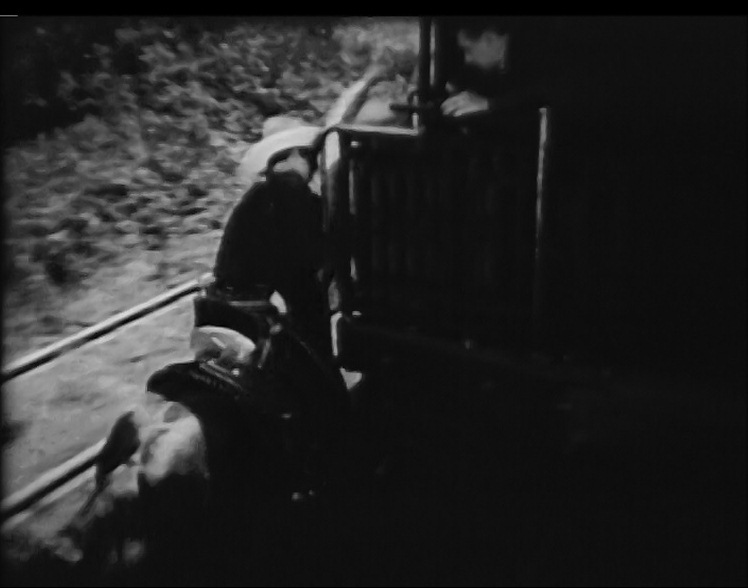 I wish I had a better print of the thing, but I guess you can’t be choosy with a 90 year old film. 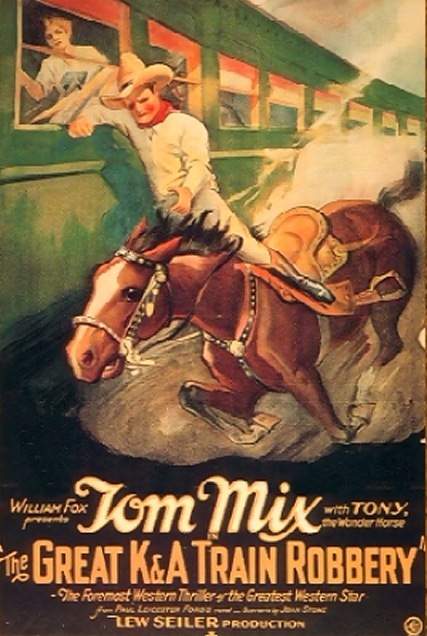 Three cheers for Tom Mix and Tony the Wonder Horse! 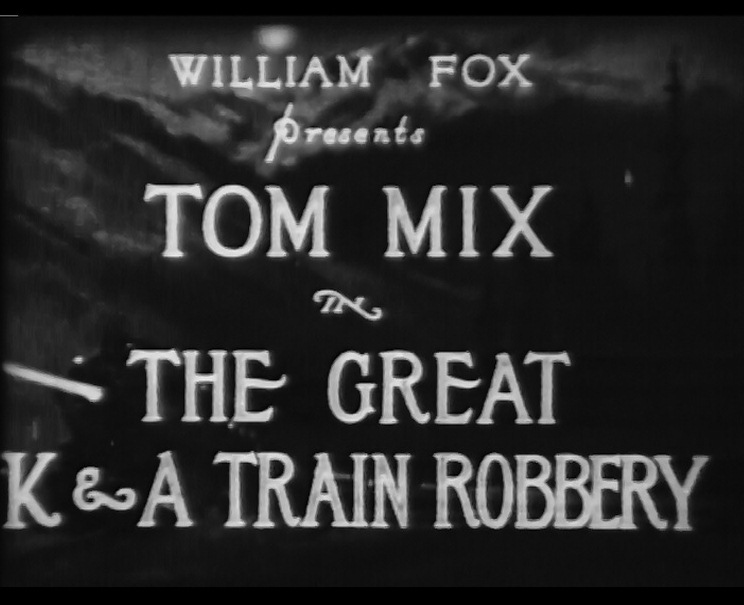 This entry was posted in Uncategorized and tagged 1926, Colorado, D&RGW, Denver and Rio Grande Western Railroad, Glenwood Springs, Pullman, Pullman Sleeper, Refrigerator cars, Royal Gorge, Silent Movie, The Great K&A Train Robbery, Tom Mix, Tony the Wonder Horse, Western movie, William Fox Pictures. Bookmark the permalink.